Peanuts are grown commercially in 15 states: Georgia, Texas, Alabama, North Carolina, Florida, Virginia, Oklahoma, New Mexico, South Carolina, Louisiana, Arizona, Arkansas, Mississippi, California, and Tennessee. However, 11 major peanut producing states grow nearly all of the U. S. peanut crop. In 2013, Georgia (44 percent) grew the largest proportion of all peanuts followed by Florida (nearly 13 percent), Alabama (12 and a half percent), Texas (nearly 10 percent), North Carolina (seven and a half percent), South Carolina (six percent), Mississippi (nearly three percent), and Virginia and Oklahoma each grew about one and a half percent. Together, Arkansas and New Mexico produced about one and a half percent of the U.S. peanut crop. There are approximately 7,500 peanut farmers in the major peanut producing regions. 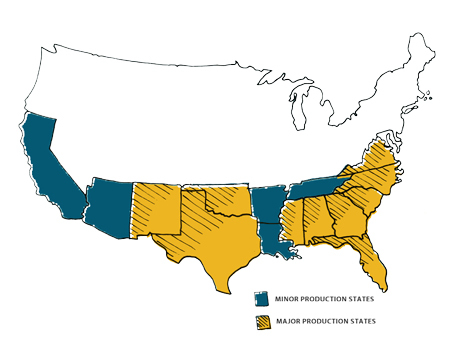 Major peanut producing states are grouped into three regions. For 2013, the Southeast region (Georgia-Florida-Alabama-Mississippi) grew about 72 percent of all USA-grown peanuts. The Virginia-Carolina region (Virginia-North Carolina-South Carolina) accounted for about 15 percent of all USA-grown peanuts. The Southwest region (Texas-Oklahoma-New Mexico-Arkansas) grew about 13 percent.